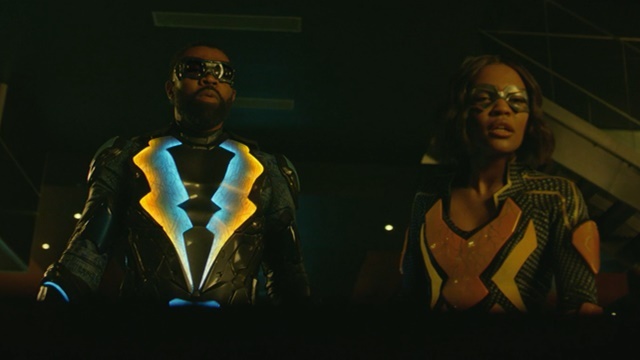 It’s fitting that Tobias was cast out of hiding and forced to go on the run just as Black Lightning’s second season came to a close. He left his collection of pod kids behind, unleashed his meta quartet on the public and exploited racial tensions in an effort to finally kill the titular hero. His plan is a bit overkill admittedly, but what’s a man to do as his criminal empire crumbles? The Pierces’ might have found some modicum of justice for Freeland, but a new threat approaches from across the pond. A war is coming. Gambi rushes in to keep Jennifer from overloading after her collapse. She recalls her sessions with Perenna and uses that strength to control her powers as Gambi passes out from radiation burns. Jefferson and Anissa arrive only to split up again quickly. Anissa and Jennifer take Gambi back to the Sanctum while Jefferson investigates Tobias’ hideout. He discovers the pod kids inside and immediately informs Lynn. She enters just in time to stop Helga from shooting Jefferson, delivering a rather cathartic beatdown. Helga offers to flip on Tobias and is taken into police custody shortly before Odell waltzes in to reclaim the pod children. Tobias and Cutter regroup at the penthouse as anger oozes from Freeland’s kingpin. He decides to weaponize the city itself, whipping its citizens into a frenzy after the police aren’t charged in the shooting of Cape Guy. The 100 influences the public into rioting as Tobias watches from on high. He uses the riot as a smokescreen to shut down the city’s power grid, weakening Black Lightning. It works at first as Black Lightning and Thunder are overwhelmed by the Masters of Disaster despite an assist from Lala. He didn’t factor in Jennifer though. With Gambi’s help, she jump starts the city’s main generator and the MoDs are defeated. The Freeland PD really should have beefed up their security for informants testifying against Tobias after so many of them died. Helga is placed in a cell, but the power outage coincides with the arrival of teleporting bounty hunter, Instant. Markovia still has much interest in Helga, and he’s here to bring her back. He phases her out of the building as Henderson is left to ponder how many more witnesses will disappear from under his nose. His plan ruined, Tobias lashes out at Cutter as she stops him from freeing the pod kids remotely. It’s her last act as Tobias’ right-hand and lover as she walks out, leaving him alone to free the pod children. The young metas stumble around as Lynn and Odell determine what to do. Jefferson and Anissa arrive as Odell disappears. The sight of dozens of children partially lost to time is jarring, but they know where Tobias is, and they have to take him down. Jennifer wants in on that action too even though she’s with Gambi. 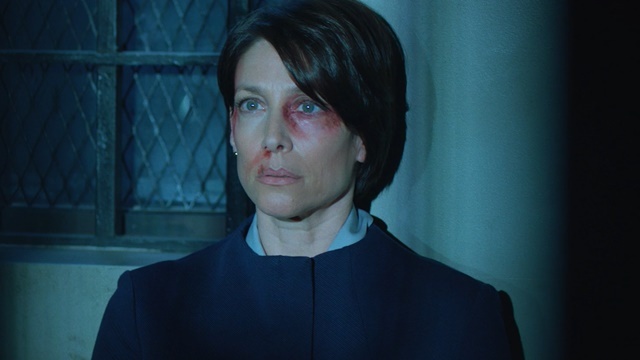 She gets the address to Tobias’ penthouse and flies out of Gambi’s van to confront him. As they make their way there, Tobias is confronted by Lala. Tobias’ control phrase doesn’t work and Lala’s gun does little damage. The two fight until Tobias breaks out another control phrase,”E Pluribus Unum,” and sends Lala convulsing to the floor as his body is branded with more of his victims. Jennifer flies in to even the odds and immediately gets the upper hand. Jefferson arrives and forces Jennifer to spare Tobias. It’s father-daughter beatdown time as the two beat Jefferson’s nemesis into unconsciousness and sends him to a black site prison for meta-humans named the Pit. The Pierces’ and the police do what they can to curtail the rioting as Rev. Holt returns, promising that love will heal the city’s wounds. With Tobias behind laser bars and the pod kids out of ASA control the Pierces’ gather for another one of their famous family dinners. Jefferson gets emotional, expressing how much he appreciates being able to have his family together and safe. Tobias’ arrest puts an end to a lifelong quest for vengeance, but Black Lightning’s work is far from done. Odell arrives to let them know that he knows about their heroic secrets and that Markovia is bringing a war to Freeland. This city is the only one that compares to the nation in terms of meta-human population, and the Markovians can’t have anyone usurping them. What Odell leaves out in his warning is that he has three meta-humans stashed away in secret pods: Wendy, Issa, and Khalil. 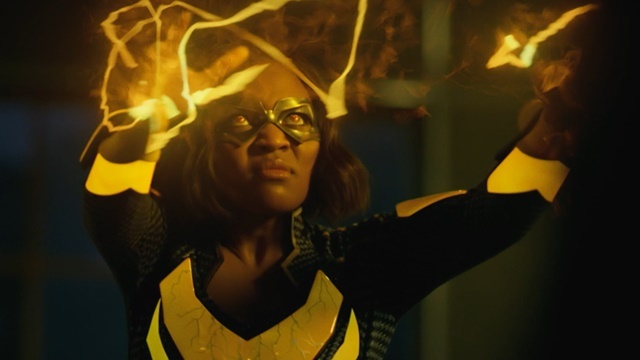 What do you think about Black Lightning season 2 episode 16? Let us know in the comment section below!